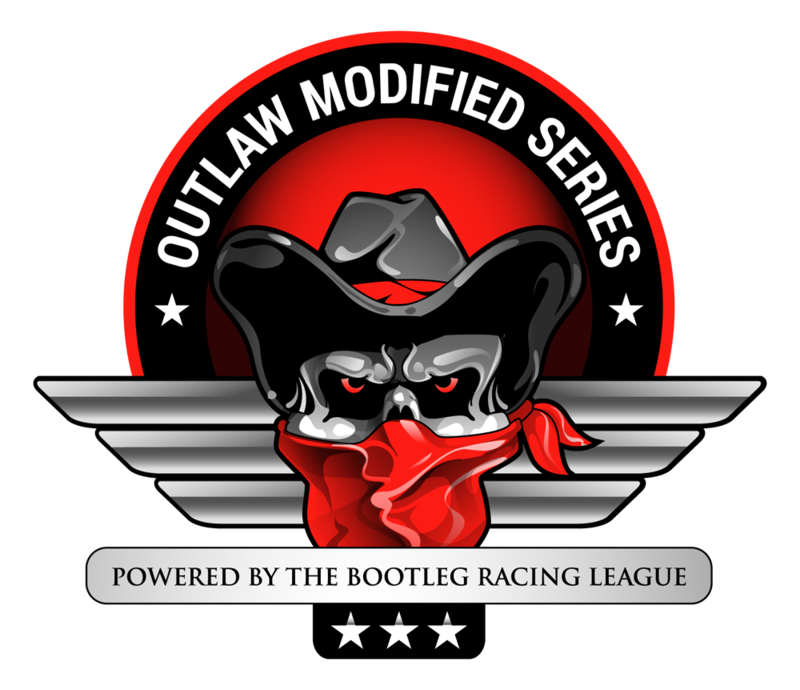 We use Discord for interviews with GSRC before and after the Outlaw Modified Series races. Make sure your INPUT device is your microphone and OUTPUT device is your headset/speakers. Note: You can also test your microphone and playback volume levels here. It’s highly recommended to also adjust the PUSH TO TALK RELEASE DELAY. By default, it is set to 0, but it should be set to a few hundred ms to avoid voice cutouts during interviews. Double click the Bootleg Racing League room and you are ready to race! The key change is enabling all the elements, so they can be moved. By default that will be forceVisibleWhenMove=0 so change the “0” to “1” to enable. If you wish to use all of your screen resolution for the UI, you will want to enable two more command lines. As before, change the “0” to “1” to enable. Want to start over with your UI Offset? Delete all the information under the “UIOffsetPos” container. Then save the “app.ini” and then relaunch the game. Everything will be back in it’s default position. Go to Documents, iRacing and open the app file in notepad. Scroll to the SPCC section and find the line: carLowHiPadding=1.000000 I don’t remember what the default setting is but mine (1.000000) needs adjusted. The higher the number, the more space is between cars before you get the “clear” call. Keep in mind that you’ll get the “car low/high” call at the same distance. Go to Documents, iRacing and open the app file in notepad. Scroll to the following 3 lines and change the 1 to a 0 (zero). This also works for the fast repair check box. By changing these lines, the sim will NEVER automatically check your tire or fast repair boxes when you leave pit road. Now, go into a test session. 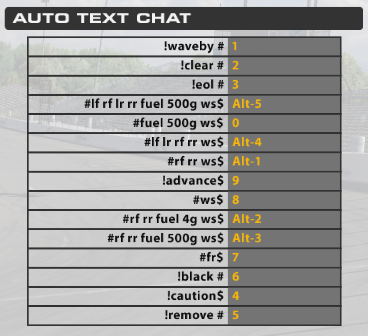 Go to Options, Options and then find Auto Text Chat. Both the left and right column in this box can be edited. Ignore all of my commands that start with !. These are admin controls. The others begin with # to let the sim know they are pit commands. To change 4 tires, fill with fuel, and have the windshield cleaned, I use ALT-5 on my keyboard. If I just want right side tires and a splash of fuel and a windshield tear-off; ALT-2. The $ is so you do not have to hit enter. If I need a fast repair, I hit 7. This allows me to pull into my pit stall and see how much time is required for any repairs without being forced to use the fast repair. You can program any keys or buttons on a wheel or button box for these.